I love eggplant, but it is often very expensive. However yesterday at Foodtown they were selling big glossy specimens for only $3 so I immediately put Moussaka on the menu. I always cook enough for 2 meals, so although a bit of time and effort is involved tonight, tomorrow night will be just heat and eat! And like a lot of dishes – it tastes even better the next day. Wash and trim eggplant and slice into 1cm slices. Sprinkle liberally with sea salt and leave for 1/2 hour to remove excess liquid and bitterness. Rinse, pat dry with paper towels, brush with olive oil and grill until soft and lightly browned. Set aside to cool. Saute onions and garlic gently in olive oil until translucent and softened. Add mince, breaking up any lumps with a fork, and saute until lightly browned. Add carrot and celery, then tomatoes, wine, bayleaves, cloves, cinnamon and allspice. Reduce heat, cover and simmer 45 minutes. If any liquid remains, simmer uncovered until it evaporates – the mixture must be quite dry to avoid too much moisture in the finished dish. Melt butter and add flour. Stirring constantly, cook 1-2 minutes over medium heat until bubbling. Add 1T of milk and whisk until smooth. Keep adding milk in small batches and whisking until smooth over heat until all milk is added. You can remove from heat before each addition if you tend to get lumps, but I find this tedious and don’t get lumps if I mix quickly with a whisk! Cook over medium heat, scraping bottom of pot with a wooden spoon, for 10 minutes until sauce thickens and coats the back of the spoon. Remove from heat, stir in parmesan and nutmeg, salt to taste. Sprinkle bottom of large baking dish (I use a roasting pan) with half the breadcrumbs. 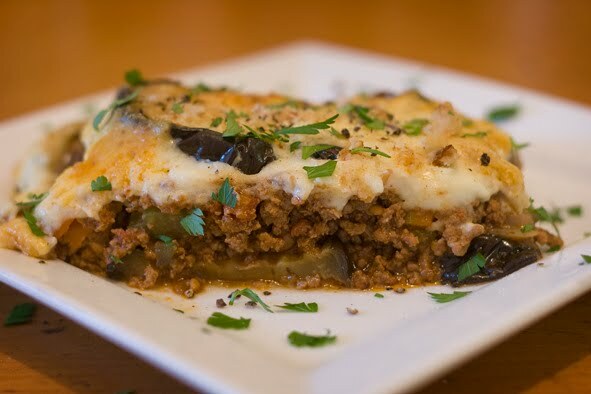 Layer half the eggplant slices on breadcrumbs, top with mince mixture, and cover with remaining eggplant. Pour sauce evenly over top. Bake 30 minutes, then sprinkle with extra portion of parmesan and remaining breadcrumbs, then bake 15 minutes until golden brown. Serve warm, with a green salad, crusty bread, and the rest of that bottle of wine.